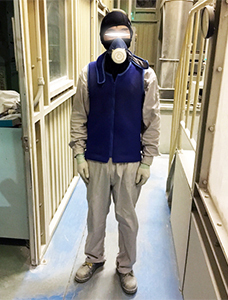 Industry Applications vol.4 Welding & Coating worksites - COOLEX The Ultimate Protection Against Heatstroke in Extreme High Temperature Environments - Kamakura Seisakusho Co., Ltd.
Welding and Painting Industries can get unbearably hot! Cool down 15°C with COOLEX! 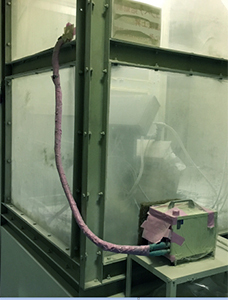 with a constant circulation of ~10°C water. 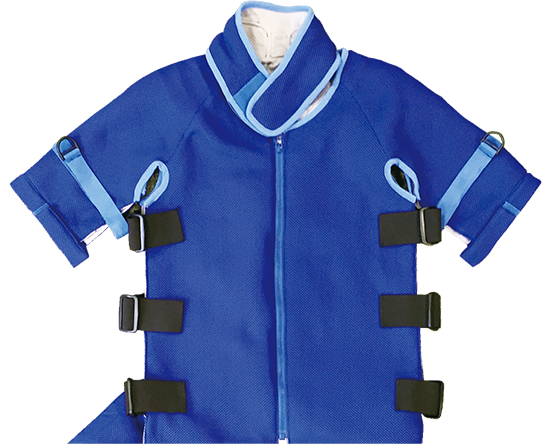 COOLEX will effectively cool the wearer's body with the constant flow of cold water in extreme high temperature working environments. Portable and for use anywhere with an AC electric power outlet. ・Cooling where you need it. ・Always stays cool during operation. ・Cooling effect does not diminish. 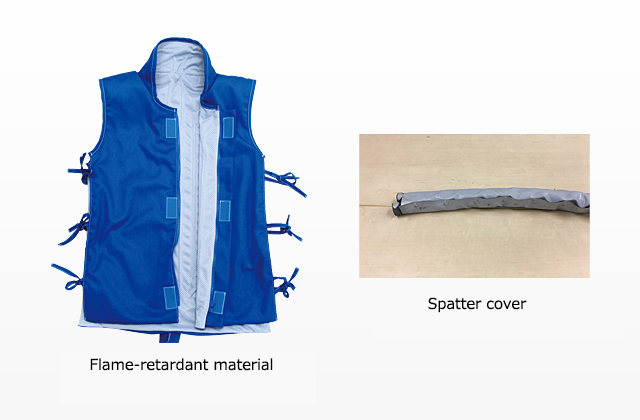 COOLEX workwear directly cools the wearer, making it a highly efficient and effective cooling solution. Hose cover can be used in conditions up to 150℃. 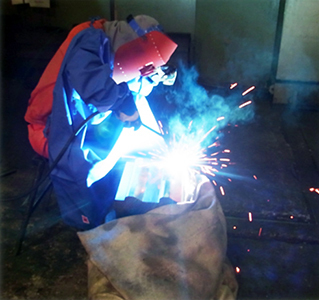 We do mold repair welding work. 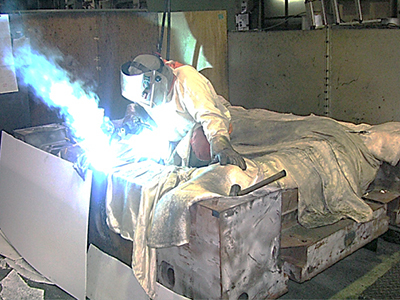 Because we work with large metal molds preheated to 300°C while doing the welding work, we are constantly blasted by the heat. Because wind adversely affects our work, we could not use a blower or an air conditioner, so we were having a lot of difficulties battling the heat which therefore limited us to 30 minutes at a time because of its intense heat. 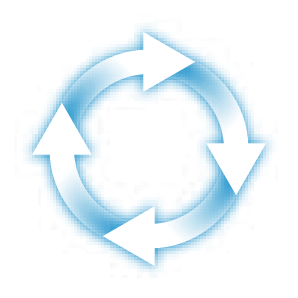 We conducted tests at our site using demo models. There were three of us doing the testing and we all rated them highly on their cooling ability. We hung the connecting hose from the welding gantry. We therefore had to change the connector on the COOLEX clothing to a special specification. We purchased five COOLEX system sets, one for each employee. Cooling effect is overall very good. To maneuver the hose better, we are considering the optional hose balancer. We must first prevent our workers from overheating, but we expect that we will now be able to extend work times. 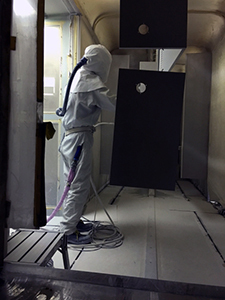 This task consists of spray coating finished goods in a booth. Because the work area is near the kiln, temperatures can reach up to 50℃ in the summer. Winds can affect the spray coating process, so we opt to use a spot cooler in the workplace, however the spot cooler is placed a little further away. We also had air-blown tubes using the factory's air compressor and worn under the work clothes, but the air temperature is high on hot summer days, and even with both that and a spot cooler, we were not getting the cooling we needed. We found COOLEX at an exhibition and decided to try it out. The workers were able to stay cool without the worry of wind affecting their work. Actually, we also produces chillers, but because of the higher costs of developing this cooling system, we have decided to use COOLEX. Some workers said that it worked too well. The workers are wearing COOLEX over their work clothes but under their protective gear, providing enough cooling. The temperature can be adjusted throughout the job as well. They were able to make sure coating did not get on the chiller and hose.